TONIGHT: Brother Can You Spare Some Rent? 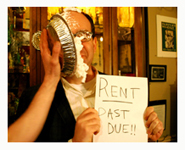 Pie the Landlord! Thatâ€™s right â€“ the City Reliquary will have our very own cigar-chomping, unshaven, smelly Landlord demanding our rent! Tell him where to shove it with a whipped cream pie in his face! Madame LuLu LoLo, Fortune Teller Extraordinaire: She Sees All and Knows All and Your Fortune Might Help Pay Our Rent! Hobo Photos a Go-Go: Take your picture in our hand painted carnival sign.Â Remember the Recession of â€™09 with a photographic keepsake! Depression-era movies: shown on the projector in the backyard. Laugh it up with Mae West, the Marx Brothers and James Cagney. Oil drum fires: (and more modern propane heaters) to keep you warm while you chill in the cold. All fires will be regulated carefully by official FDNY supervision! DIY Fingerless Gloves Table! Because nothing says Depression-chic than rockinâ€™ a pair of fingerless gloves! Prohibition-era Beer provided by the Brooklyn Brewery and Depression-era â€œRumâ€ Punch provided by the City Reliquary at contemporary-recession era cost. Homemade Mulligan Stew by Chef Master Mark at wallet-friendly prices. DJ Stacher playing hits from the economically challenged 1930s (Harlem Jazz) and 1970s (early Rap); as well as Big Money tracks from the 1980s (disco) and 2000s (electro). Get down! The previous diversions will set you back a very “Depression-friendly” $2.00 – $5.00 a pop (in addition to the suggested donation of $10.00 at the front door). All proceeds will be used to help the City Reliquary pay (last monthâ€™s and this monthâ€™s) rent. Brother Can You Spare Some Rent? February 27, 2009 7:00 – 11:00 p.m. The only item I can think of that has (arguably) been overlooked is Housing Court. Sure, this is not exactly the stuff of the 1930’s— but speaking as someone who has been there I can attest that it would excellent fodder for a board game, Kabuki play and/or a rock opera.